Hopefully you've all been spending the last few weeks honing form, tuning equipment, and brushing up on Victoria's back roads. Or maybe you've been spending time on the beach, drinking cider and playing with throwing knives. Either way, it all goes down this Sunday. 100km, lots of elevation. Tarmac, gravel, confusion and chaos. -Registration is at 5 Crease Ave (Recyclistas bike co-op.) from 9:15 onwards. Race starts at 10. Payment ($10/ racer) in cash, please. 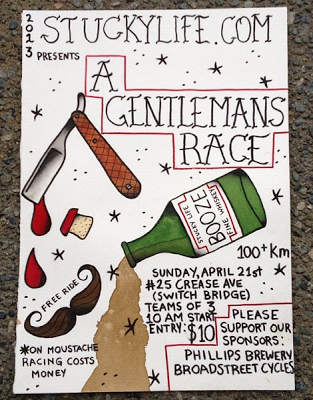 -The Gent's Race is designed primarily as a road race. A geared road bike with 23-25mm tires is probably the best tool for the job at hand. -Gravel. There will be some optional gravel/ off road sections. 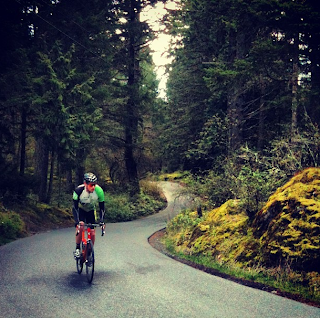 In all instances the gravel shortcut offers a quicker route from a-b. Some of these will be indicated by checkpoint volunteers. Some will be obvious only with a dose of local knowledge. -Route. The checkpoints will be revealed after registration. The route you take is up to your team. A little bit of help will be provided, but riders are encouraged to get creative. A smartphone with mapping capabilities can be helpful here. -Food. Clif Canada has been kind enough to step up again with sponsorship. There will be some nutrition freely available mid-route. Water, as well. -Support. There will be a car at the start and finish. You are welcome to bring a bag with clothes/ food/ drinks for after the race, and throw it in the vehicle. -Teams. Teams of three riders. All teams are to hit each checkpoint together, and finish together. Mixed ladies'/ men's, as well as mixed single speed/ geared teams are encouraged. -Fixed/ SS. Teams with fixed gear or single speed riders will complete an approx. 80km course. Finishing times should be similar to the geared riders. -Prizing. We have a sweet selection of prizing from local vendors. Categories include first ladies' team, first fixed gear team, DFL, and youngest rider. *The excellent poster from local crusher Craig Lunn will be offered as one of the prizes. Stoked!